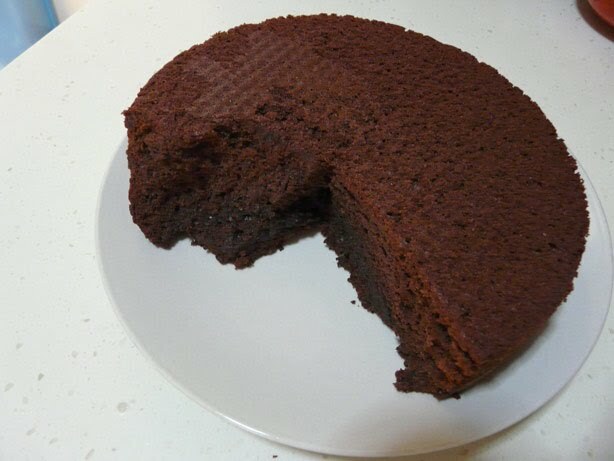 I baked this chocolate cake on Sunday night, covered it in cling film, and placed it over a bowl sitting on a moat (plate full of water). It is definitely out of reach of Cookie's paws. On Monday, upon returning from lunch, to my dismay, the whole cake has been 'transported' out of the bowl, and onto the kitchen table top. And there is bite mark on the cake! Creme smelled the aroma, jumped up onto the kitchen table top, and somehow scooped or pushed the cake off the bowl, and it landed right on the edge of the table where Cookie could reach it with her mouth. Cookie took a big bite of the cake, and Creme, after smelling it left, right and centre, decided that she doesn't want to eat the cake afterall, and ran away. However, we did suspect that Creme took that bite because she has a history of eating kuih lapis before. Chocolates are toxic to dogs, they cant' break down two components - Theobromine and Caffeine - as effectively as human and these cause the toxicity. Thank goodness, Cookie didn't have any untoward effects from eating the chocolate cake. Phew!